A printer driver is essential for accessing the printer from a different device. The driver has to be updated, secure and most importantly, compatible with the operating system of your device. Dell printers come with an installation CD comprising the driver. 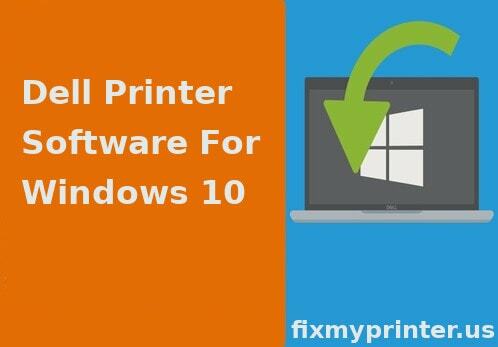 It is recommended that you download the updated version of the Dell printer software for windows 10 as the driver on the CD may or not be compatible or updated. You can also directly install the printer driver from the Windows 10 OS. Quick and detailed instructions for installing the printer driver on Windows 10 OS is given in the following sections. Go to the manufacturer’s site and enter your printer’s service tag. Click Download against the driver that you want to install. Wait until the file downloads. Right-click the downloaded driver file and select the Run as Administrator option. Click the Yes option in the User Account Control window. Read the prompts and respond appropriately. Refer to the steps below to install the driver directly from Windows 10. Connect the printer to your Windows 10 computer using a USB cable. Open the Printers & Scanners folder on your device and then select the Add device option. Click The printer that I want isn’t listed if the printer is not detected. Proceed with the prompts to complete the driver installation. Step 1: Power up your printer and plug out the USB cable from it if you have connected it to the computer while setting up the printer. Open a browser from your device and go to the Dell Driver & Downloads page. Type the Service tag of your printer and then select the Submit option to install Dell printer software for windows 10. Step 2: The service tag is an Alpha-numeric code assigned by the manufacturer specifically for your Dell printer and is used for accessing the information about your printer. If the Service tag is not available, click the View Products option on the Driver page and select Printers. Specify the type of your printer and then choose your printer model. Step 3: To get a complete list of drivers for your printer, click the Category menu and select the Application option. From the list of options, select the Not Specified option. All the drivers and software packages for your printer will be displayed. Step 4: Ensure to select the driver compatible with your operating system to downlod Dell printer software for windows 10. Go to the Operating system option and select Windows 10. Click the icon next to the printer driver and select the Download option. Step 5: If you are prompted to specify a location for extracting the files, create a new folder on your desktop and name it. The file will be saved with the .exe extension in the folder. Run the extract command and specify the name of the newly created folder. Step 6: Now, right-click the driver file and select the Run as Administrator option. If the User Account Control window, click the Yes option on the window. Step 7: The installation will begin. Read and respond to the setup instructions to complete the installation. Do not connect the printer and your computer unless prompted by the installer. Once the installation completes, click the Start menu and then select the Printers and Faxes option. If the printer is listed on the window, print a test page. Step 8: You can also try adding your Dell printer to Windows 10 OS. First, connect your Dell printer to the computer using a USB cable. Power on the printer. Now, click the Start icon on your Windows 10 OS and then select the Settings menu. Step 9: Click the Devices option and then select the Printers and Scanners option. On the right toolbar, click the Add a printer or scanner tab. Wait for the Windows to detect and display your Dell printer. Step 10: Click the Printer icon and then select the Add device option. If the printer is not displayed, select The printer that I want isn’t listed. Follow the instructions to add the printer manually to download and install the Dell printer software for windows 10.